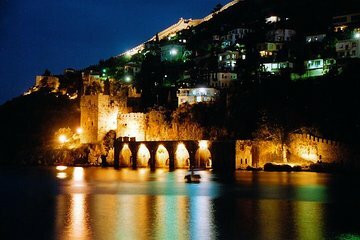 Experience the magic of the Mediterranean at twilight on this 4-hour BBQ dinner cruise from Alanya, including hotel transfers. Board an atmospheric pirate ship and watch the sunset over landmarks like Alanya castle, Antique Shipyard and Red Tower, as you tuck into your barbecue dinner on deck or take a swim in the bay. Finally, join your fellow shipmates for a fun foam party disco before you head back to the harbor.